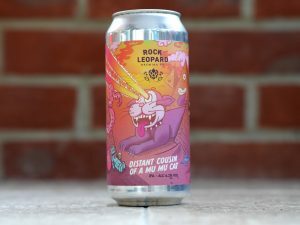 Rock Leopard don’t currently have a permanent home, which makes you wonder how they brew. Perhaps they sneak into other breweries while the owners are off enjoying two weeks in Benidorm. DCoaMMC is the first beer I’ve encountered that advises you to drink straight from the can. What is this, the 1980s!? I pour into a glass anyway, and it would be a shame not to – you’d miss the hazy gold colour and the fantastically dense, shaving-foam head. Aromas of tropical fruit and fresh citrus are not shy in rising to meet you. The taste is a fantastic medley of mango, pineapple, kiwi fruit, spice and sherbet. The texture is smooth and creamy, but after a while the roof of your mouth saturates with all those tingly hops. The aftertaste is a diminuendo of hops, with spiced pineapple in abundance. It’s a very promising start for a fledgling brewery. Let’s hope they get their own premises soon. And that they don’t end up burning a million cans of their own beer.